While Avastar-2 supports the face bones from the Bento Rig, this page is about the prepared face expressions from the Secondlife System character. Those expressions are actually based on Shape keys and do not apply to custom Mesh characters! when you look for Bento face expressions, we currently do not provide any face presets. Face expressions: We support all 20 face expressions. For SL you can only add one Face Expression per Animation. 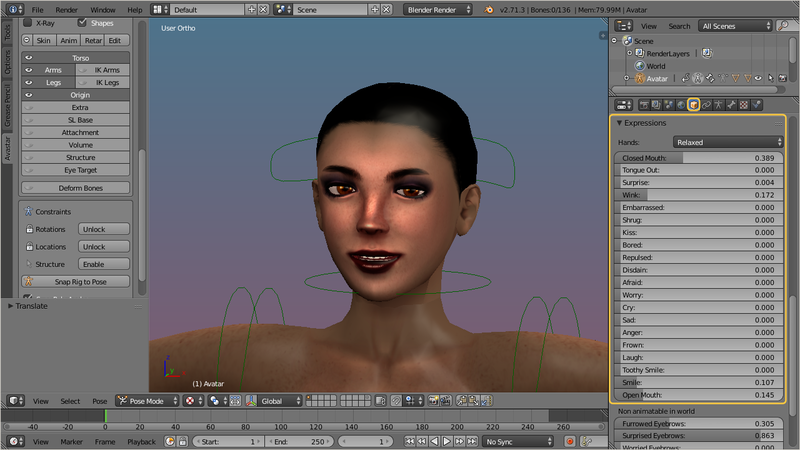 In Blender the face expressions can even be animated (key framed). Important: Although the Expression sliders can be combined and keyframed (animated) in Blender, animated face expressions are not (yet?) available in SL or other compatible online worlds (like OpenSim for example). An SL Animation can only contain one single Hand expression. And this hand expression will remain valid for the entire animation sequence in SL. If you need to change the Hand expression during your animation sequence, then you will have to split the animation into pieces and then merge the animations in the SL animation editor. Note: By default the Expression “Closed Mouth” is used!